Surrendering oneself to this doll-like image of Christ as a child requires one to cast off the world of adult preoccupations to live in a state of faith and pure belief. 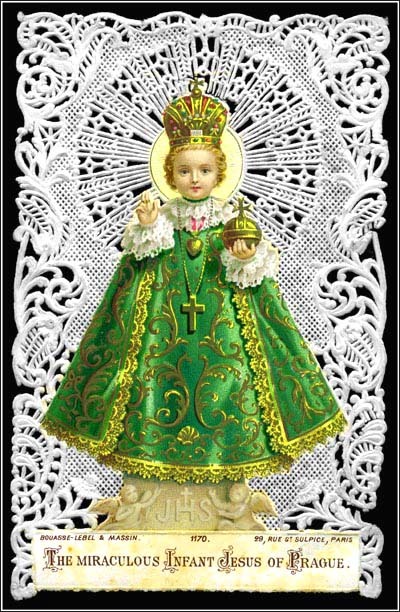 Honoring the Infant of Prague is a tradition that is kept in many homes throughout the world as some believe that it guarantees financial stability and abundance. There are several novenas to the Infant of Prague, one reflecting the intensity of an emergency situation, is to be done in one day’s time, the prayer said once every hour for nine hours in a row. Devotion to Christ as a young child dressed as a king has its roots in the Carmelite order of Spain. According to tradition, in 1555, Saint Teresa of Avila gave a statue of the Christ child, dressed in actual royal robes to a noblewoman who was marrying into an aristocratic family in Bohemia. Taking it with her to what is now the city of Prague, her daughter, the Princess Polysena inherited it. In 1623, Princess Polysenia was widowed and chose to devote the rest of her life to charitable causes. When she saw the need that the poverty stricken Carmelite order had, she donated the statue to them, saying, “I give you my dearest possession. As long as you venerate this image, you will not lack anything.” The monks credited this image with the immediate upturn of their fortunes. When they were forced out of their monastery due to a war in 1631, they left the statue behind and the invading army threw it in a rubbish heap. Within seven years the Carmelites were back in their monastery in Prague, desperately attempting to rebuild it. One monk, Father Cyril, who had a particularly strong devotion to the Divine Infant found the little wax statue among the rubble. The only damage done to the statue was its crushed hands. It was decided that the scarce funds the community had should go to more practical things than the repair of a statue. As the monks struggled to rebuild their former home and church, Father Cyril heard the words: “Have pity on me and I will have pity on you. Give me my hands and I shall give you peace.” After the statue was repaired, the monks again displayed it in the main church. As the city of Prague suffered an epidemic, parishioners began invoking the little statue for aid. The quick answer to their prayers brought many in the surrounding region to seek help. Gradually, the devotion spread to many other countries. Today, the church in Prague built to hold the statue, Our Lady of Victory, is a site of pilgrimage with visitors from all over the world paying their respects to the Divine Infant. Imperial Orb: The entire world is in his hand. O Infant Jesus, I run to You, begging You through Your Holy Mother to save me in this need (you may name it here), for I truly and firmly believe that Your Divinity can defend me. Full of trust I hope in You to obtain Your holy grace. I love You with all my heart, I am painfully sorry for my sins and on my knees I beg You, o Little Jesus, to free me from them. My resolution is to improve and never more to offend You. Therefore, I offer myself to You, ready to suffer everything for You and to serve You faithfully. I will love my neighbour as myself from my heart for the love of You. O Little Jesus, I adore You, o Mighty Child, I implore You, save me in this need (you can mention it here), that I may enjoy You eternally, with Mary and Joseph see You and with all the angels adore You. O Jesus, Who has said, ask and you shall receive, seek and you shall find, knock and it shall be opened to you, through the intercession of Mary, Your Most Holy Mother, I knock,I seek, I ask that my prayer be granted. O Jesus, Who has said, all that you ask of the Father in My Name, He will grant you through the intercession of Mary. Your Most Holy Mother. I humbly and urgently ask Your Father in Your Name that my prayer be granted. through the intercession of Mary, Your Most Holy Mother, I feel confident that my prayer will be granted. (Excerpted from the app: “Novena: Praying with the Saints”). This entry was posted in Christ, Debt, Financial Distress, Novena, Prayer and tagged Financial Distress by sandra dipasqua. Bookmark the permalink. I’;m so happy that so many have received favorable answers. My deceased mother made the Powerful Novena to the Infant of Prague with MANY favorable answers and spread devotion to the Infant. His statue is in every room of the house. Sadly, I have made the Novena for a special intention – with the opposite effect. I beg Our Lord Jesus not to leave me this disappointed. Please, Infant Jesus of Prague, mindful of my needs and in memory of my mother, please, answer my petition and the many listed here. By the Grace of God the Father, and through Our Lady’s Intercession be merciful to me. Thank you. Amen. I have found that having prayed to the Little Infant for nearly 60 yrs sometimes my prayers aren’t answered as I’ve wished them to be but in other ways. We are on the breadline renting with only the pension and both suffer bad health and family problems There seems to be no way out of this situation and it gets us down, but we always seem to manage! and I know that the little Infant is watching over us. I am so thankful for the graces bestowed on us. My faith in Him is immense! My Mom also had a devotion to the infant,I have come to realize after her passing. I will pray on your behalf. Thank baby Jesus!!! For all prayers answered for my son Isak. I prayed this twice, once to find a house and then again for our offer to be accepted. The moment I finished the second time I got a message from our realtor saying they accepted our offer. There were multiple offers on this house. Praise and glory to Jesus, Mary, and Joseph and the power of their love and intercession . Novenas. St. Jude, sacred heart of Jesus, st. Michael, st. Anthony, st. Mary, st. Timothy, our lady of clouds, our lady of remedy, our lady of good remedy, and all our beautiful saints that never failed us. You helped me so much in ways I can’t describe. God bless you for this beautiful website. Thank you baby Jesus. i prayed i prayed to you the 9 hour novena last friday and got healed the same day. Thank you st.Jude, the infant of Prague, the sacred heart of Jesus, emergency novena mother Teresa, our lady of remedy, our lady of my.Carmel, and st.Anthony prayers that helped me through my difficulties. I’m truly honored to find these novenas that you posted. Keep up great work you done. God bless. Thank Sweet Infant Jesus of Prague for prayers answered and always being with me and my family. Thank you Scared Heart,Blessed Mother and Saint Anthony for prayers answered and always being with me and my family. Forever devoted. Thank you for putting these different novenas, Thank The Miraculous Infant Jesus of Prague. Someone is helping me with my financial problems , ST JUDE AND SACRED HEART OF JESUS TO ALL OF YOU THANK YOU!!! Without being specific, we were in need and I’m convinced the novena got us through!! Thank you baby Jesus!! !